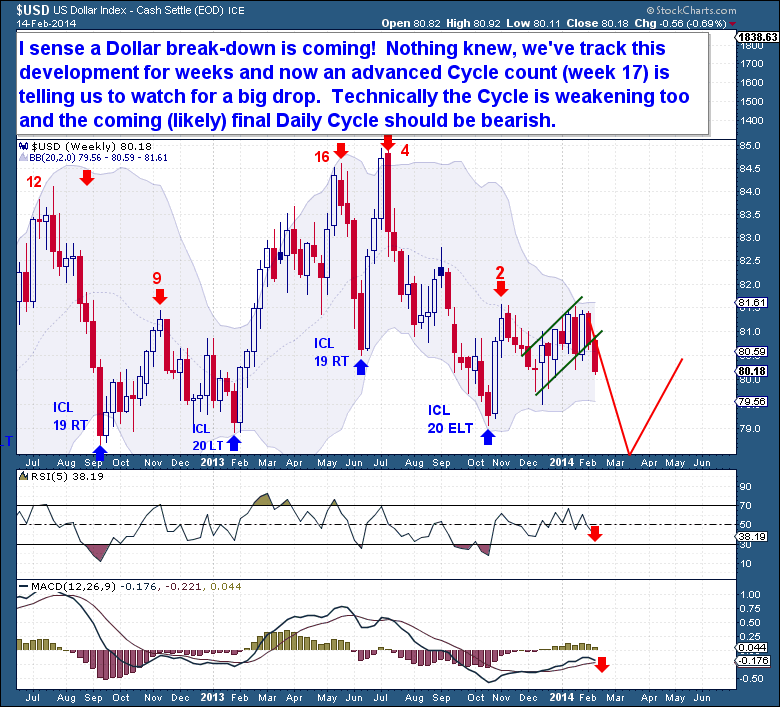 I called for a larger drop in the Dollar mid-week because the Daily Cycle was near an end and clearly rolling over. Declines into Cycle Lows can move much deeper and longer than we expect, so I would not be surprised to see a few more sessions lower to start the week. But the timing is such that we should be prepared for at least a mild counter-trend bounce near the end of next week. 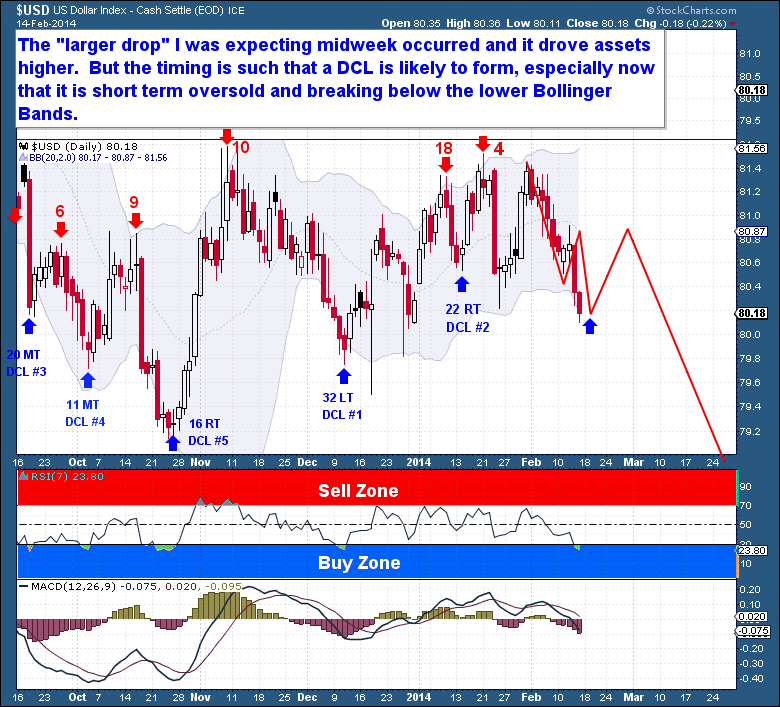 The decline has reached a somewhat oversold level, and the Dollar index has fallen slightly below the lower Bollinger Band. The RSI is also in my “buy zone”, further evidence that a Cycle Low is imminent. But the Dollar’s decline is likely to only just be getting started. The Euro went through an 8 week consolidation and now appears to be breaking up in a move which could extend considerably higher. 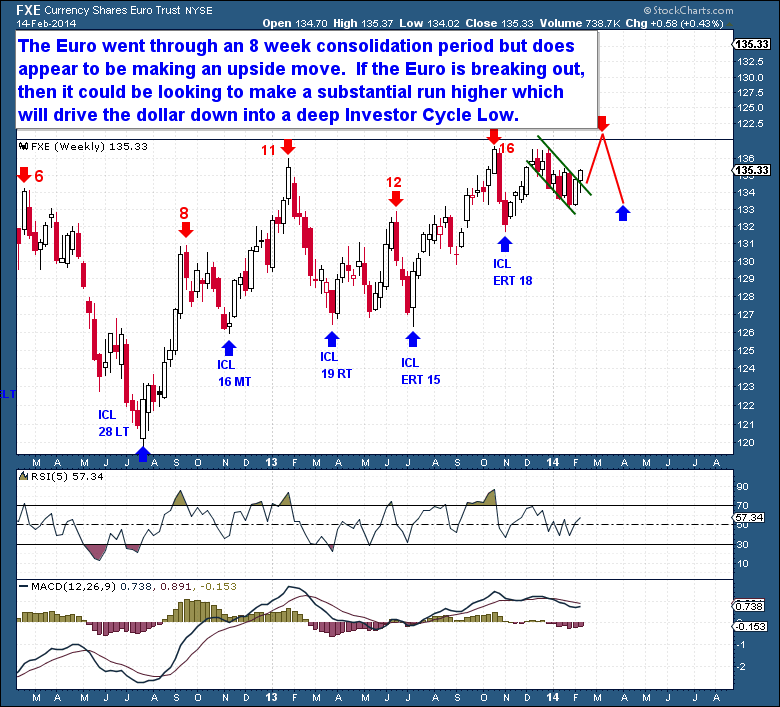 If the Euro is breaking out, it could be looking to make a sustained run, which will almost certainly drive the Dollar index into a deep Investor Cycle Low. I’ve shown that a significant Dollar break-down is coming, and the weekly chart looks ready to confirm my analysis. We have 2 back-to-back Left Translated Investor Cycles (topping in weeks 4 and 2 respectively), so there is no doubt that the long term (3 year) Dollar Cycle is in decline. The last Investor Cycle failed (meaning a lower Cycle Low), confirmation that the 3 Year Cycle has topped. The long term decline of the dollar is not a new development – we’ve tracked it for many weeks. But with an aging Investor Cycle (week 17) telling us to watch for a big drop, there should be nowhere for the Dollar to hide. Technically, the IC is weakening, and the coming Daily Cycle should be extremely bearish. A RESET OF 204 money supplys will happen ,a gold backed tradenote or tradedollar will change the WORLD for every .YOU ARE CHARTING THE PAST GET REAL !!!!!!!!! !.